Manufacturing thousands of different flexible coupling types, YTMPipe has the right solution for most applications. Made of tough elastomeric polyvinyl chloride (PVC), the flexible couplings are strong, resilient and unaffected by soil conditions. They are also resistant to chemicals, ultraviolet rays, fungus growth, and normal sewer gases due to the inert nature and physical properties of the PVC material. YTMPipe flexible couplings are leak-proof, rot-proof and seal against infiltration and exfiltration, giving you confidence in your pipe connections. 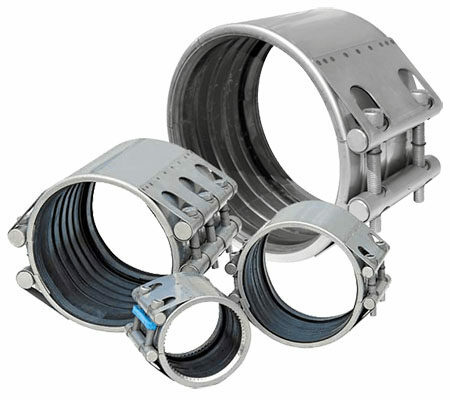 Flexible Coupling is used at water and gas lines, water and waste water treatment plants, production and chemical industries, power plants, mining, shipbuilding industries and various engineering scopes. It’s for an ideal solution for all operations under pressure. It is not necessary any special tools during usage. It can be tolerating vibrations and slight twisting via its seal (+5mm). YTMPipe coupling is designed for exact solution of leakages. It can be mounted in a few minutes easily. Gripped couplings are used extensively on PE-PVC pipes, especially on pipelines where vibration is high. As with the Flexible Couplings, the parts of Gripped Flexible Coupling is AISI304 / 316 stainless steel, EPDM / VITON / SBR / NBR depending on the process to be applied.